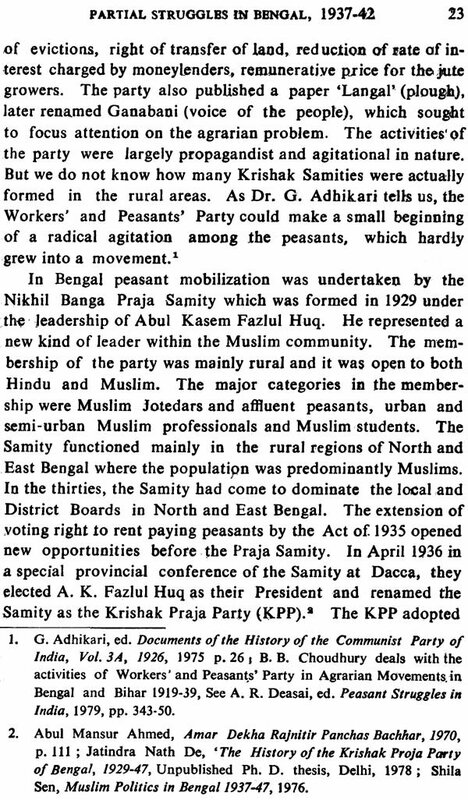 This book which has grown out of a doctoral dissertation focuses on the peasant movements in Bengal and Bihar during 1936-47. 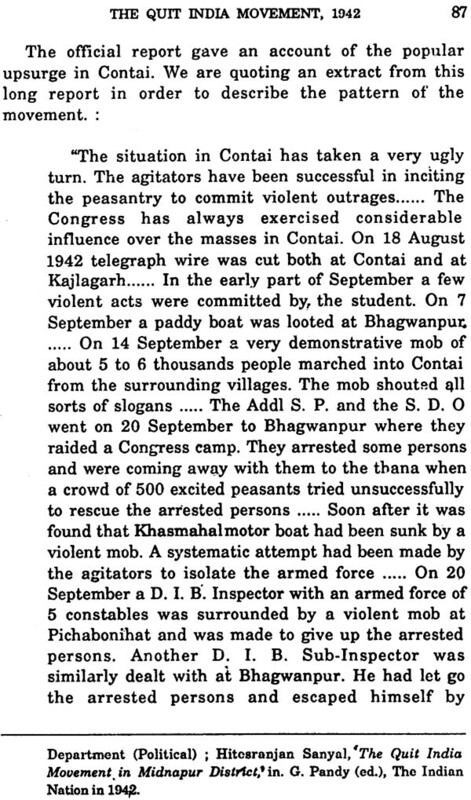 Throughout the book the emphasis is on the positive part played by peasant movements in undermining colonial rule. 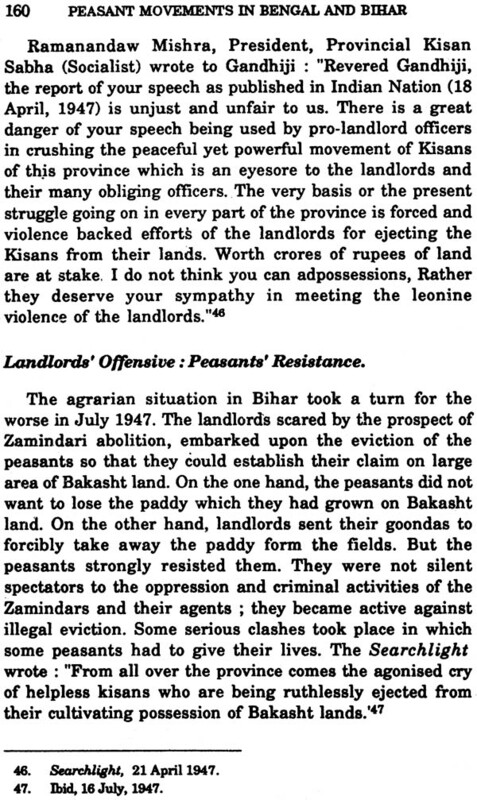 From 1936 onwards the peasant movements undermining colonial rule. From 1936 onwards the peasant movements were designed to bring about a peasant revolution. 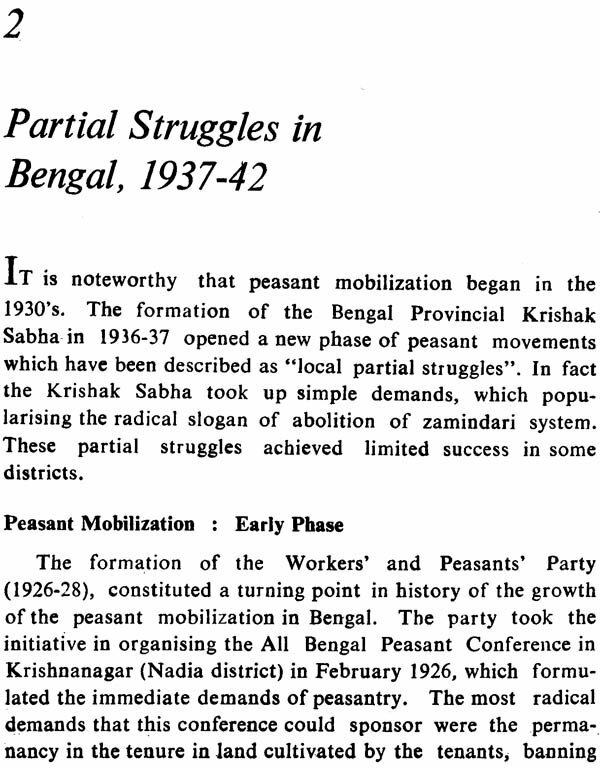 Millions of peasants, particularly poor peasants, were mobilised in Tebhaga and Tanka struggles in Bengal and in the Bakasht movements in Bihar. The Quit-India movement too had considerable popular support. This book based on new material collected from archives and newspapers reveals heightened political consciousness of the peasants. It breaks new ground in describing the revolutionary potential inherent in peasant movements in this country. 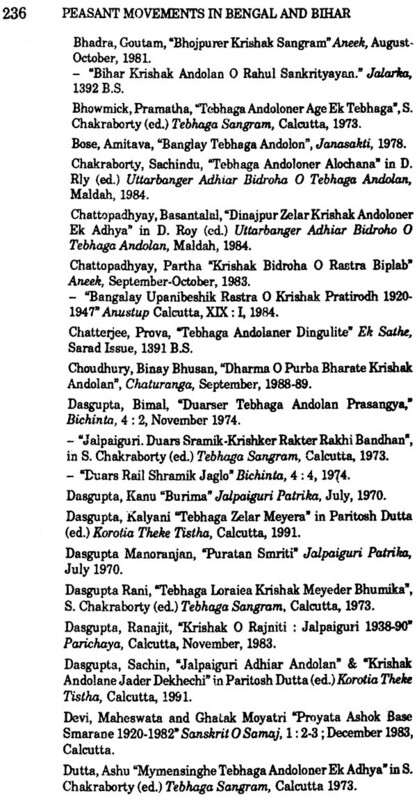 The present work is a revised version of my doctoral dissertation submitted in Rabindra Bharati University in 1985. 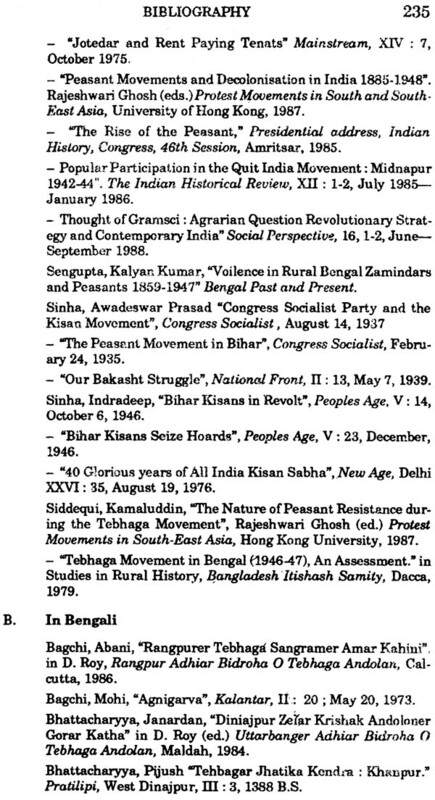 Although research in peasant movements is now intense, few books offer a synoptic view of the peasant movements in Bengal and Bihar during the period 1936-1947. 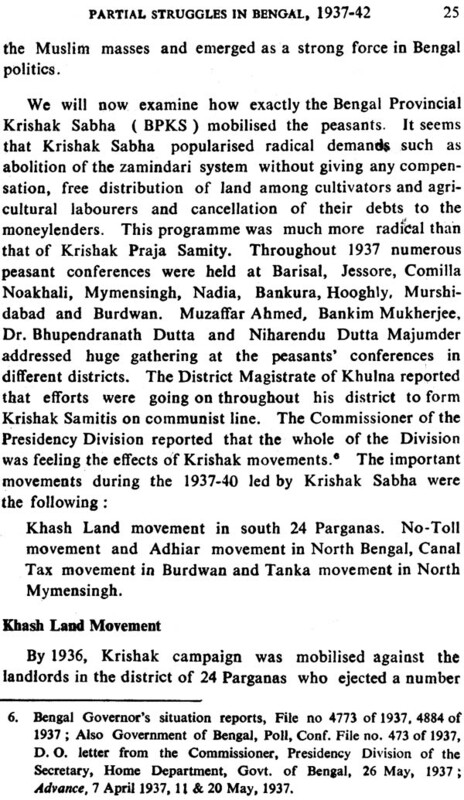 The study beings from 1936 which witnessed the formation of the Kisan Sabha that spearheaded the agrarian movements. 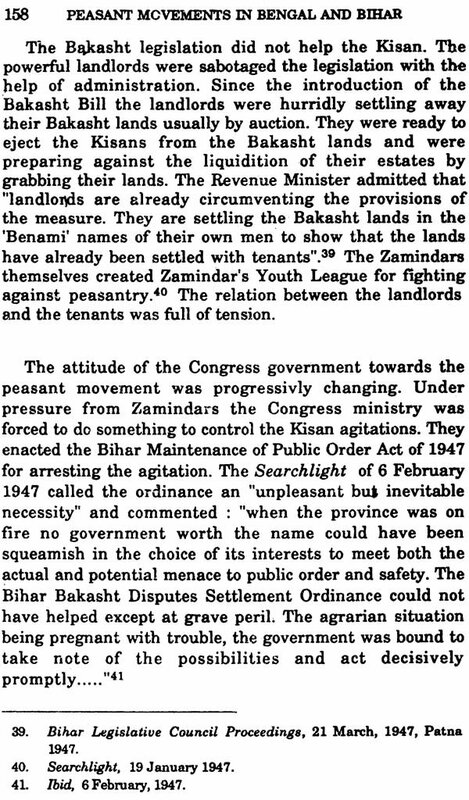 Throughout this work the emphasis is on the part played by the Kisan Sabha in mobilising the peasants against the landlords. Radical consciousness among the backward peasants came from without. 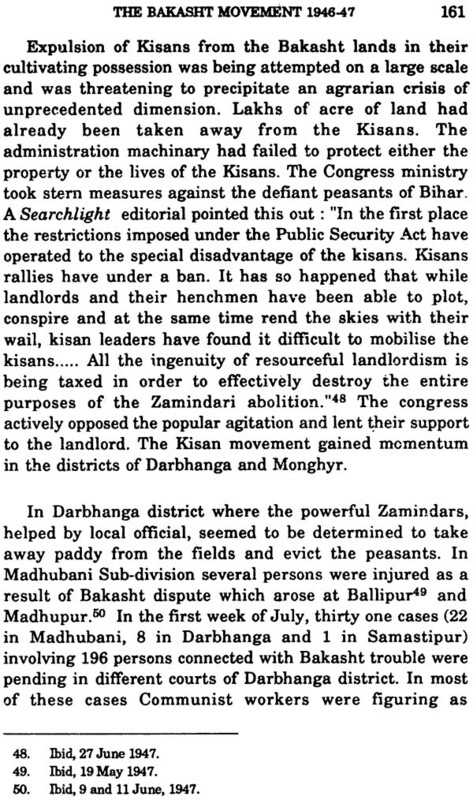 In this connection the role of the leaders of the Kisan Sabha deserves particular mention. I have chosen to deal separately with the Quit India movement that marked a peasant upheaval in Bihar and in some parts of Bengal, notably Midnapur district. 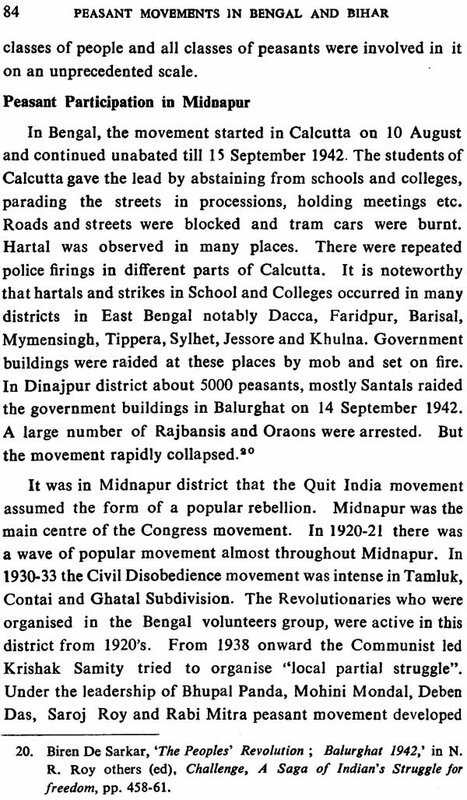 The story of the Quit India movement in Midnapur is based on the confidential reports on the movement which are available in the India Office Library. Few scholars have used these reports which throw new light on the popular participation in the Quit India movement. The peasant struggles during 1946-47 were unprecedented in sweep and intensity. Millions of poor peasants drawn from scheduled casted and tribes were mobilised in Tebhaga and Tanka struggles in Bengal and in the second wave of the Bakasht struggle in Bihar. These struggles reflected the heightened political consciousness of the peasants. 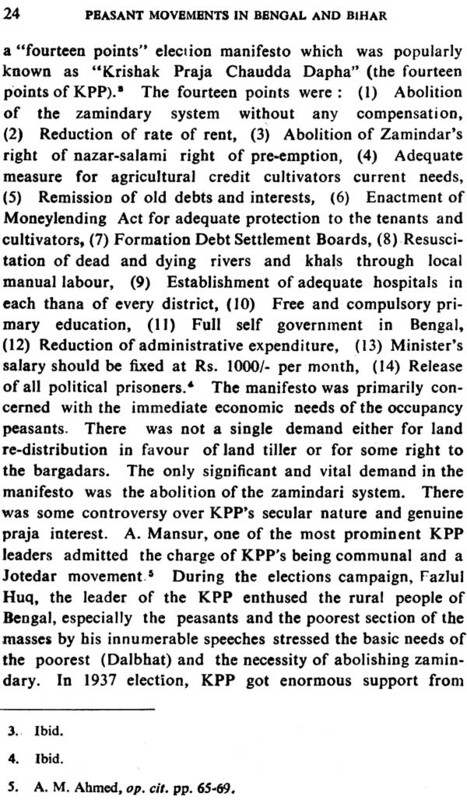 Numerous peasant cadres emerged as local leaders. What was a new feature was the participation of peasant women in meetings and demonstrations. Even so, these movements did not culminate in an anti-imperialist and anti-feudal revolution. In this book an attempt has been made to examine the factors that led to the collapse of these movements. What was the role of the working class during the crucial period? I have sought an answer to this question in this work. 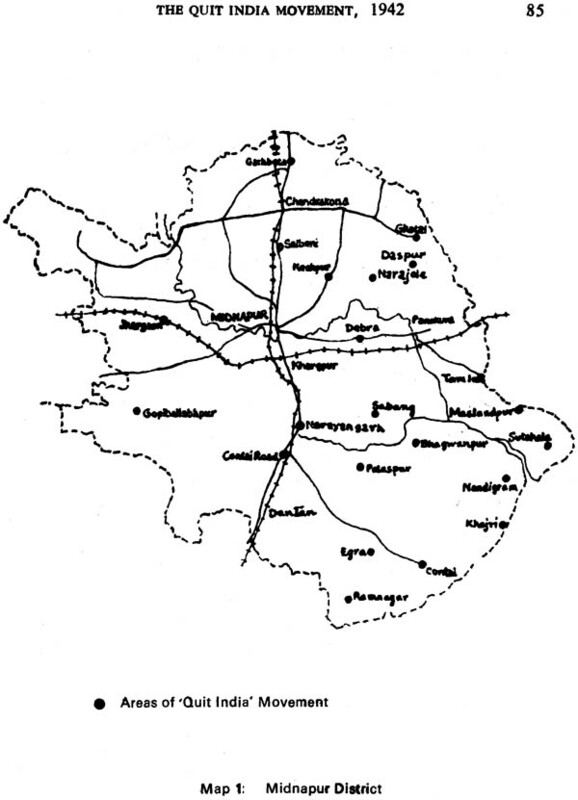 Several scholars have already dealt with the Tebhaga movement. In the concluding section I have examined their views. 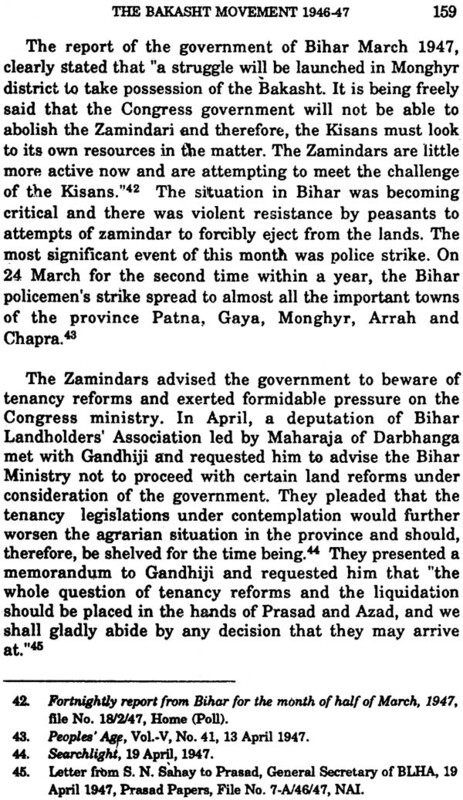 It has been considered necessary to deal briefly with the theories on peasant movements as put forward by Hamza Alavi, Eric Wolf, Barrington Moore, D. N. Dhanagare, Jaques Pouchepadass and Jean Chesneaux. My deepest regard in writing this work is to Professor Sunil Sen who supervised my research for seven years. I must say that without his suggestions and inspiration it would have been impossible for me to complete the work. 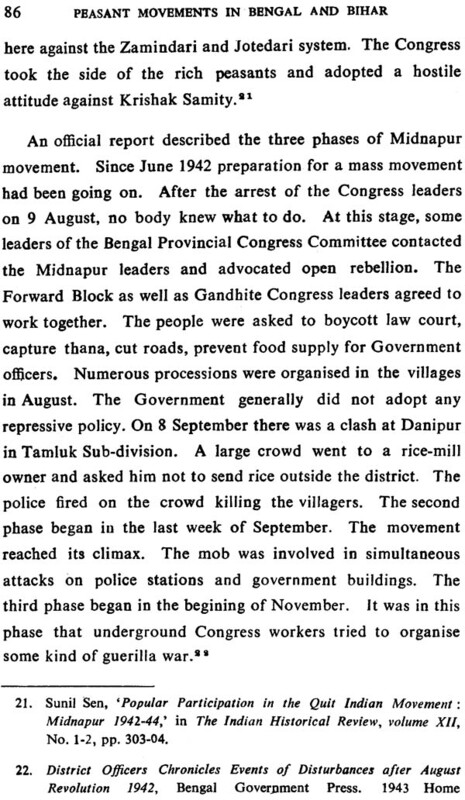 Prof. Sen has kindly lent me microfilm of the confidential reports on the Quit India movement and F. O. Bell papers. My deep sense of gratitude is due to Professor Binay Bhusan Choudhury of Calcutta University and Professor Amalendu De of Jadavpur University who have offered valuable comments which I have tried to incorporate in this book. 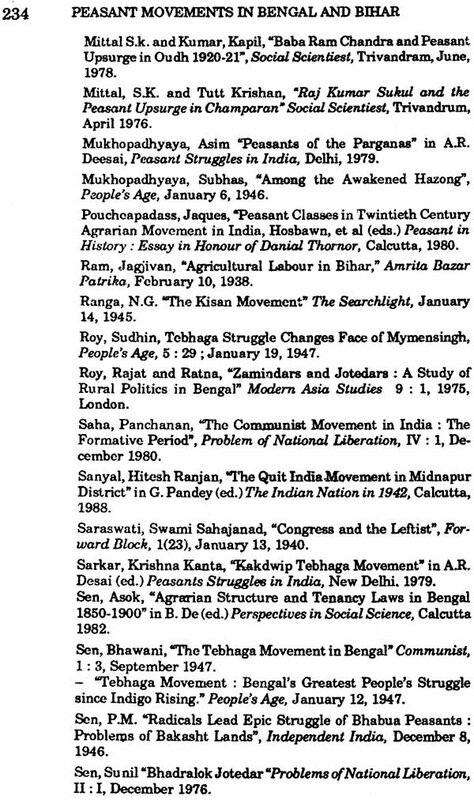 Professor Sumit Sarkar of Delhi University, has recommended the publication of this work. My thanks are due to Professor Ramaranjan Mukherjee, formerly Vice-Chancellor of Rabindra Bharati University and Professor Pabitra Sarkar, Vice-Chancellor of Rabindra Bharati University who showed keen interest in this work. I will remain grateful to the Rabindra Bhatati University which has undertaken the publication of this work. The Service Printer Press has assisted me a lot in publishing this book quickly. My wife Santwana assisted me greatly at every stage of the preparation of the book. I should thank the Indian Council of Historical Research, New Delhi for sanctioning subsistence allowance to enable me to work in the National Archives of Inida, Nehru Memorial Museum and Library, Ajoy Bhavan, New Delhi and Bihar State Archives, Patna. Immense help had been rendered to me by the National Library, Calcutta, West Bengal State Archives and Muzaffar Ahmed Smriti Granthagar, Calcutta.